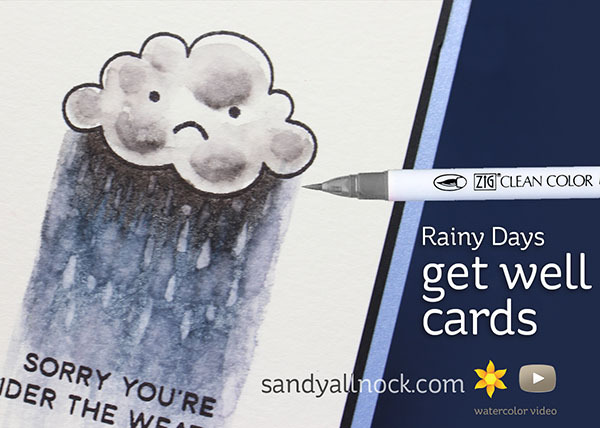 LOVE your cards Sandy – your angry clouds and raindrops look AMAZING – they’re making my day feel better already!!! I just love that first card with the grumpy cloud! Great colouring! I especially like the first 2 cards! I love that shaker card with the stars! Fantastic cards, Sandy. Thank you for the video. I love watching you color and paint and I always learn so much from you. I have a small set of the Zig Clean Color markers and I’m going to give your rain technique a try! The shaker card is so pretty. I love it love it love it. Thanks for showing an amazing card. Love the video and your blog. Love your grumpy cloud and the amazing rainy skies your created. Awesome cards, I absolutely love the shaker card! So many fun ways to use this stamp….thanks. Every time I see that Rainy Days stamps, I love them more and more. Such an adorable set. Love the little sad cloud! I agree with you on not always needing to use the “happy face”. Your clouds are wonderful for those days when things aren’t so bright. Your talent is just so wonderful and it is inspiring, I thought you should know that. I just adore your cards! I have never seen the frownie face and I love the way you have used it. Thank you for sharing! That’s a mean looking cloud. Great card for someone who is sick. Great layouts. Always enjoy your videos! Cute cards with all the little clouds – great coloring !!! Really sweet and cheery rainy day cards with fabulous coloring! Thanks for the video! What a lovely trio of cards!! My favorite is the second one!! LOVE the angry cloud within the shaker!! So pretty!! TFS! These cards are great! I love how you’ve used unusually gloomy colours with a cheery sentiment! Love your rain themed cards! Great use of the cloud die and as always, your coloring is so fantastic! I love this set! If I were having a bad day or didn’t feel well, this little cloud image would certainly cheer me up. It brings smiles! Oh, WOW! I love your card and I really love that you are so good at what you do that you would make a dark grey cloud card wearing a white sweater! I hope you are warm and dry again. Love the card and the tips are so helpful! Thanks so much! Very unique way of using the rainy day cloud and umbrella stamps! Great cards & fantastic coloring! Really, really cute cards for some not so nice occasions! I love both cards and your coloring. Thanks for the video, love watching you color and create cards. I love the sad cloud and the coloring on it….